Considering the popularity and desire for a round diamond, this cut was invented much later than other diamond cuts. It took years upon years of craftsmanship and perfecting the cuts in order to create this unique diamond shape. It was the diamond cutters’ consistent effort to bring about a cut that has the most facets in the best proportions to maximise its brilliance. With 58 facets, the round cut is precisely conceived to maximise the brilliance, fire and sparkle. Because of its perfect proportions and ubiquitous style, round cut diamonds are not only the best choice for engagement rings but any other jewellery. It is a perfect choice for women who want to flaunt their timeless elegance and finesse. However, a round cut is notoriously known for being the cut that generates maximum wastage. When cutting a rough diamond into perfect round shape with multiple facets, much of the actual weight is lost, so the cost of each carat is much higher than other fancy shapes. Because of its popularity and demand, more 75% of all the diamonds in the world are round shaped. THE BEGINING: A round cut diamond was invented over a period of time by perfecting the cutting technique to create most facets and proportion that would maximise opulence and fire within a diamond. The cutting technique of a round diamondwas first invented in 1919 by Marcel Tolkowsky. He had published his thesis on "Diamond Design” that described the perfect proportions of a round cut diamond for maximizing light’s performance and refraction (or brilliance) and dispersion (or fire). Its 58-facet cut, divided among its crown (top), girdle (widest part) and pavilion (base), is structured through an accurate framework to achieve maximum fire and brilliance. 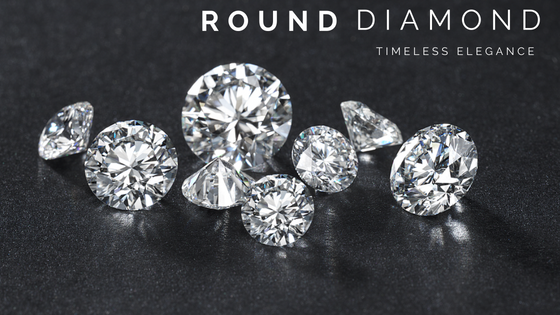 POPULARITY:By capturing more than 75% of the entire diamond supply worldwide, the round brilliant cut diamond is by far the most popular shape available today. This shape is a benchmark for all other diamond shapes. Because of its uniform silhouettes this shape fits best in all types of jewellery beside diamond engagement. This is easily the best diamond shape if one wants to buy diamonds online in any part of the country including Melbourne. Round cut diamonds look best when set in prongs, tension set, and bezel setting, as they add to its fiery beauty. When a series of smaller size round diamonds are crafted in pavé setting or flush setting, it makes for an attractive anniversary band or engagement ring. RATIO: Every diamond shape has a length-to-width ratio, which showcases how a diamond will look face up from above. While purchasing a round cut diamond, look for a length-to-width ratio between 1 and 1.03. A ratio above 1.05 will make it look flat. Along with length to width ratio, stress should be on meticulousness in measuring a diamond as well as considering the 4C’s so that you know the exact shape, proportion and characteristics of the round cut diamond that you are considering. ROUND DIAMOND PRICING: Considering a diamond on per carat basis, round cut diamonds cost more than any other fancy shapes for two reasons in particular- popularity and relatively low yield because of wastage. As almost 60% of the rough diamond is lost in cutting a perfect round diamond, the cost of each carat shoots up. Also taking into fact that the outstanding fire, brilliance and sparkle only a round diamond possesses, makes it one of the most desirable cut that demands a high premium. A round diamond is more valuable than the other alternative shapes available of equal clarity, carat and colour. Finally, a round diamond visually looks bigger in size as compared to fancy cut like princess. Where 1.00 ct of princess cut is approximately 5.5mm, a round cut measures 6.4mm when considered from above. The depth % of a diamond is calculated by dividing the depth by the width of the diamond. So, if a diamond is 3.5 mm in depth, and 5.5 mm in width, its depth % is 63.63%. The lower the depth %, the larger a diamond of a given carat weight will appear.